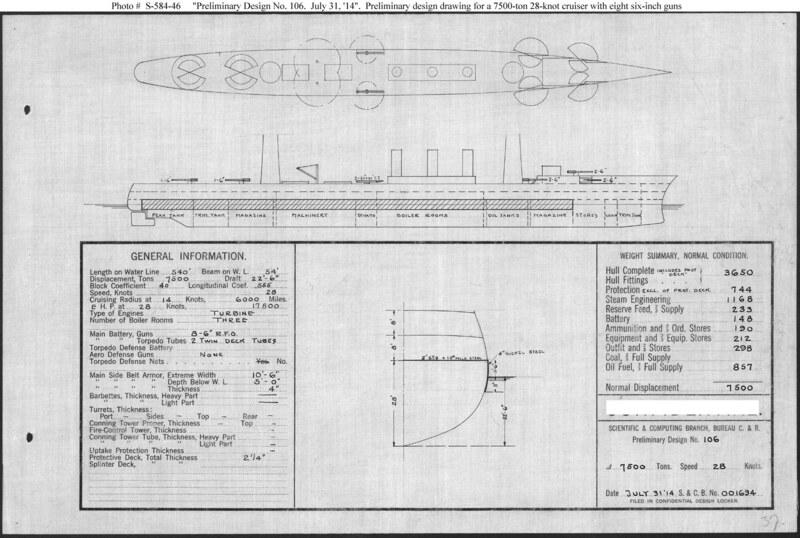 Untitled preliminary design drawing prepared in response to a request of 10 July 1914 from the General Board in support of their development of characteristics for scout cruisers planned for inclusion in the Fiscal Year 1916 shipbuilding program. This plan provides eight 6-inch guns and a speed of 28 knots in a ship 540 feet long on the load water line (L.W.L. ), 54 feet in beam, with a normal displacement of 7,500 tons. This plan reflected an informal consensus of the board's Executive Committee on design priorities at the time. Considerable debate followed before the board issued characteristics in late 1915, however, and a wide range of design options was explored prior to settling on the concept employed in the construction of the Navy's next cruisers, the Omaha class of the Fiscal Year 1917 to 1919 programs (see Photo # S-584-093).